Discover why Sinai Akiba Academy is the best fit for your child! Schedule a tour, ask questions, and learn about the application process. Or reach out to Admissions Director Lisa Zide any time. We look forward to hearing from you! 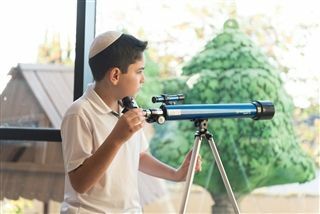 Sinai Akiba Academy engages students in the joy and discipline of learning. We nurture a community of ethical, critical thinkers who, shaped by our evolving Jewish tradition, walk through the world with confidence and humility. 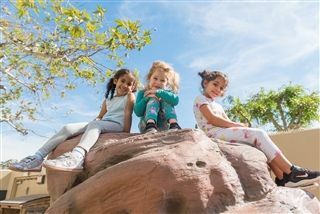 At Sinai Akiba Academy, your child thrives amid a carefully curated combination of educational ingredients that foster independence, curiosity, and joy in learning. Sinai Akiba Academy is more a community than a campus. Our students come from across the city, throughout the country, and around the globe. No matter where their journey begins, our students learn there is strength in diversity, and they discover that what makes us different is less important than what makes us the same. Strengthened by extraordinary community support, we are leading the way in Jewish education. When you give, it not only impacts the quality of learning for each student, but also builds and contributes to the Jewish future. Eighth Grader Ayla addresses her fellow Middle School students. Inspired by her own seventh-grade project, one student embraced the values and lessons of Hanukkah to rally her peers and develop an afternoon of social awareness activities for the entire Middle School. The candle of God is the soul of a human. To kick off the holiday of Hanukkah, our Middle School students participated in an afternoon of social awareness on Friday, Nov. 30. The afternoon’s activity was conceptualized, coordinated and led by 8th grader Ayla Kattler, with the help of other 8th graders, and three faculty members, who all prepared and presented social action topics of interest. “The inspiration for the program was really my reluctance for Hanukkah to turn into an entirely gift-oriented holiday, which it often is,” said Ayla. “It was a way to connect Hanukkah to our modern world and show how the values and lessons from Hanukkah can help the students improve their community and the world at large.” The younger Middle School students participated by picking the topic that they were most interested in and spending the afternoon gaining more awareness of the topic and learning about tangible next steps. After each eighth-grade leader completed their presentation of their Public Service Announcement on topics ranging from hunger and homelessness to climate change, Middle School students wrote a call to action to share with their families and made a shamash candle for their home Hanukkiah. “I wanted the students to take something meaningful from this program, something that they could bring home to their families, such as a positive, social justice action or idea and carry with them beyond Hanukkah,” Ayla shared. Friday’s afternoon of social awareness was inspired by an English project that Ayla and her fellow eighth graders completed last year called “Social Media for Social Awareness” to the entire Middle School. The Social Media for Social Awareness project takes place annually as part of our 7th Grade English curriculum and is an opportunity for students to identify a topic in the world that is important to them. “Using their topic of choice, they start a blog, create an action statement, a meme, infographic and finally a public service announcement, all with the purpose of creating awareness about their social topic of choice,” explained Mr. Doug Hinko, Director of Innovation and Curriculum Integration, and another collaborating teacher on this project. “It is always refreshing and inspiring to witness students take classroom experiences and feel empowered to apply them to real-world situations,” he added. Experience our school for yourself by scheduling a tour today. Learn More about our Parenting Center, Early Childhood Center, and our Lower and Middle School Programs. Sinai Akiba Academy is a private Jewish day school in Los Angeles, serving students in Early Childhood through Grade 8. We also offer a variety of parenting classes and programs for children through our Parenting Center. © Sinai Akiba Academy, All Rights Reserved.